Only has front racks are configurable in depth, although the default is supplied fitted at a distance of 98 mm from the bottom of the cabinet (useful background). Rack 10 4U RackMatic brand and outer size of 370 mm (width) x 140 (depth) x 260 (high). Only has front racks are configurable in depth, although the default is supplied fitted at a distance of 98 mm from the bottom of the cabinet (useful background). 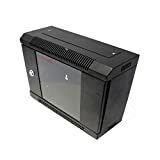 This entry was posted in Computer Hosting and tagged 370x140x260mm, cabinet, inch, Rack, RackMatic, Server, TENRack, wallmount by Host That. Bookmark the permalink.